In multiple choice problems, learners select one option from a list of answer options. 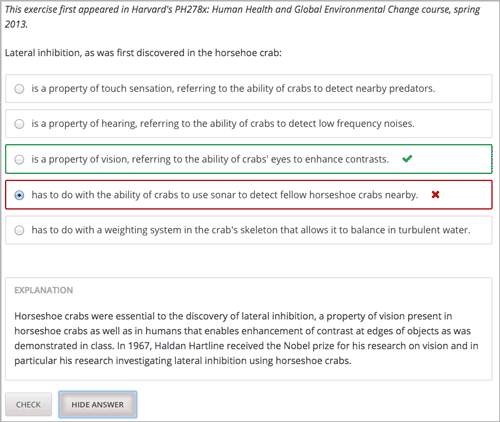 Unlike dropdown problems, whose answer choices do not appear until the learner clicks the dropdown arrow, answer choices for multiple choice problems are always visible directly below the question. Multiple choice problems can also have several advanced options, such as presenting a random set of choices to each learner. For more information about these options, see Advanced Options for Multiple Choice Problems. EdX recommends the use, whenever possible, of authentic assessments rather than multiple choice questions for graded problems. Authentic assessments in online courses tend to lead to better learning outcomes. In addition, authentic assessments allow for infinite attempts, mastery learning, and more intellectual risk taking, which lead to substantially better learning outcomes. Multiple choice questions do have these helpful uses. For many subject areas, authentic assessments are either unavailable or prohibitively complex to use. In such courses, multiple choice questions can act as the only available fallback. You can create multiple choice problems in the simple editor or in the advanced editor. You can set up a problem in the simple editor, and then switch to the advanced editor to add more configuration options in XML. However, you cannot switch back to the simple editor from the advanced editor. Therefore, you might want to format the problem as completely as possible before you begin to use the advanced editor. To use the simple editor to create a checkbox problem, follow these steps. Select one of the two multiple choice problem templates. From the list of Common Problem Types, select Multiple Choice. 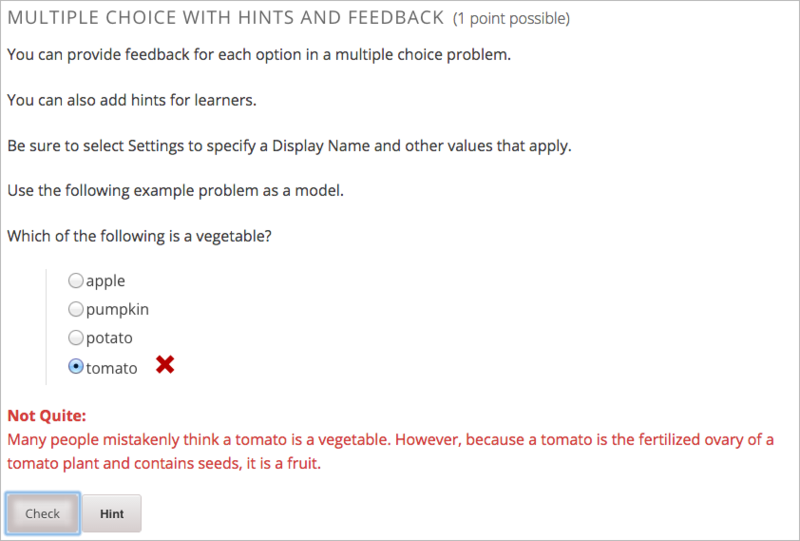 From the list of Common Problems with Hints and Feedback, select Multiple Choice with Hints and Feedback. For more information, see Use Feedback in a Multiple Choice Problem. Edit your text to place each answer option on a separate line. Select your set of answer options, and then select Multiple Choice from the toolbar. A pair of parentheses appears next to each answer choice. To identify the correct answer, add an x between the parentheses for that option. To use the advanced editor to edit a multiple choice problem, follow these steps. enables enhancement of contrast at edges of objects as was demonstrated in class. You can add feedback in a multiple choice problem using the simple editor or the advanced editor. For an overview of feedback in problems, see Adding Feedback and Hints to a Problem. In multiple choice problems, you can provide feedback for each option that a learner can select. Use the following guidelines when providing feedback. In the simple editor, you configure answer feedback with the following syntax. 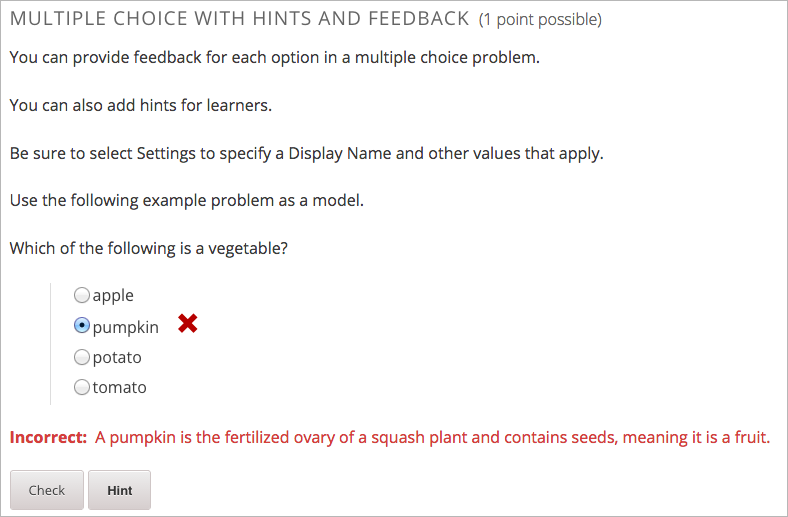 When you create a new multiple choice problem, select the template Multiple Choice with Hints and Feedback. This template has example feedback syntax that you can replace. <choicegroup label="Which of the following is an example of a vegetable?" ovary of a squash plant and contains seeds classifying it as a fruit. and contains seeds it is classified as a fruit. You can add hints in a multiple choice problem, using the simple editor or the advanced editor. For an overview of hints in problems, see Adding Feedback and Hints to a Problem. To configure a multiple choice problem to award partial credit for a specific answer, you add the following attributes to the problem XML. For each answer that you intend to award partial credit, add the correct="partial" attribute to the <choice> element. Optionally, define the percentage of the problem score to award for each answer. In the point_values attribute for the <choice> element, enter the value as a decimal. 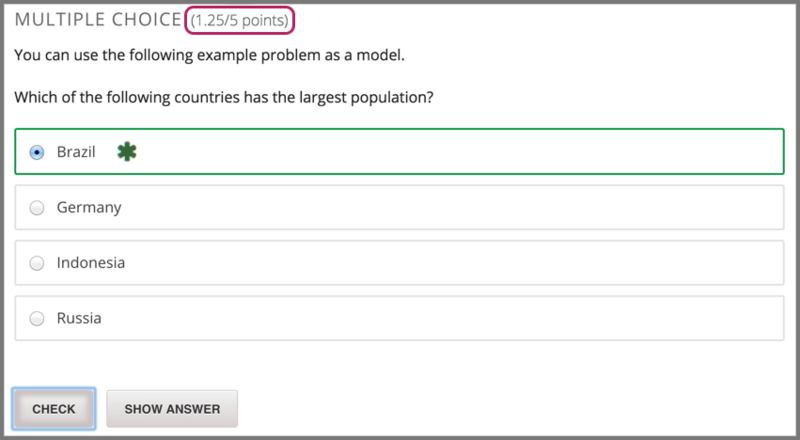 For example, you can add point_value="0.25" to award 25% of the points to learners who select that answer. The percentage awarded should reflect how close the learner has gotten to a full understanding of the concept. If you do not add the point_value attribute, the system uses a value of 50%. For example, the following XML shows the multiple choice problem template updated to provide partial credit for the first answer. <multiplechoiceresponse> (required): Indicates that the problem is a multiple choice problem. <choicegroup> (required): Indicates the beginning of the list of options. <choice> (required): Lists an answer option. Indicates that the problem is a multiple choice problem. partial_credit (optional) Specifies that the problem can award partial credit. If used, must be set to “points”. All standard HTML tags (can be used to format text). Indicates the beginning of the list of options. label (required) Specifies the name of the response field. type (required) Must be set to “MultipleChoice”. When set to “true”, the choice is a correct answer. When set to “false”, the choice is an incorrect answer. When set to “partial”, the learner receives partial credit for selecting the answer. You can specify more than one correct or partially correct answer, but learners can select only once choice to submit as their answer. For example, one view of a geography problem could be as follows. You can also have some answers shuffled, but not others. For example, you might want to include the answer “All of the Above” and have it always appear at the end of the list, but shuffle the other answers. You can configure the problem to shuffle answers in the simple editor. For example, the following text defines a multiple choice problem before shuffling is enabled. The (x) indicates the correct answer. To add shuffling to this problem, add ! between the parentheses of the first answer. To fix an answer’s location in a shuffled list, add @ between the parentheses of that answer. When you complete problem setup in the simple editor, select Edit and then Settings to specify an option other than Never for the Randomization setting. You can configure the problem to shuffle answers by editing XML in the advanced editor. For example, the following XML defines a multiple choice problem before shuffling is enabled. To add shuffling to this problem, add shuffle="true" to the <choicegroup> element. To fix an answer’s location in the list, add fixed="true" to the choice element for the answer. You can set value randomization as an attribute of the problem element, as shown in this example, or select Edit and then Settings to specify an option other than Never for the Randomization setting. You can configure a multiple choice problem so that explanations for incorrect answers are automatically shown to learners. You can use these explanations to guide learners towards the right answer. Therefore, targeted feedback is most useful for multiple choice problems for which learners are allowed multiple attempts. You configure the problem to provide targeted feedback by editing XML in the advanced editor. Add a <targetedfeedbackset> element before the <solution> element. Within each <targetedfeedback> element, enter your explanation for the incorrect answer in HTML as markup described below. Connect the <targetedfeedback> element with a specific incorrect answer by using the same explanation-id attribute value for each. Use the <solution> element for the correct answer, with the same explanation-id attribute value as the correct <choice> element. For example, the XML for the multiple choice problem follows. This is followed by XML that defines the targeted feedback. You configure the problem to provide answer pools by editing XML in the advanced editor. In the <choicegroup> element, add the answer-pool attribute, with the numerical value indicating the number of possible answers in the set. For example, <choicegroup answer-pool="4">. For each correct answer, to the <choice> element, add an explanation- id attribute and value that maps to a solution. For example, <choice correct="true" explanation-id="iPod">The iPod</choice>. For each <solution> element, add an explanation-id attribute and value that maps back to a correct answer. For example, <solution explanation-id="iPod">. If the choices include only one correct answer, you do not have to use the explanation-id in either the choice or <solution> element. You do still use the <solutionset> element to wrap the <solution> element.